Ally Palermo evades two Notre Dame defenders. The freshman midfielder tallied a brilliant assist after a long run through the midfield, helping to spark Northwestern’s 20-10 win. It’s starting to feel a bit like 2013. For the first time since that season — in which Northwestern ran all the way to the NCAA Tournament semifinals — the Wildcats have won both six consecutive games and nine overall home games. No. 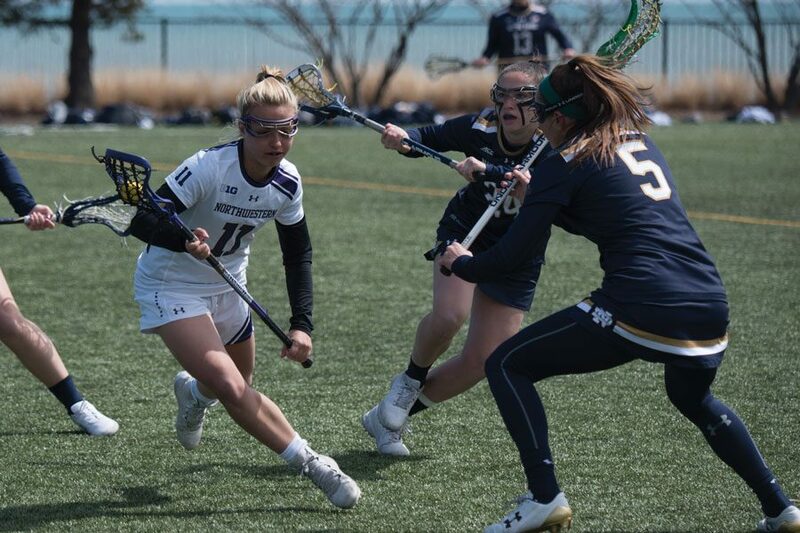 9 NU (11-3, 3-0 Big Ten) clinched both milestones by sweeping this weekend’s homestand, turning Friday’s 20-6 win over Ohio State into a rout before halftime and then pulling away commandingly in Sunday’s second half to top Notre Dame 20-10. Senior midfielder Sheila Nesselbush and junior attacker Selena Lasota continued to pad their already-impressive season scoring totals by potting 9 goals each this weekend, and senior attacker Shelby Fredericks added five assists and 21 draw controls. On Friday against the Buckeyes (5-7, 1-3), NU brushed off an early 1-1 tie to quickly find its offensive rhythm, scoring 7 goals in a six-and-a-half minute span midway through the first half and rolling to a decisive 13-3 halftime lead. The Cats easily maintained that lead throughout a second frame in which they cycled in numerous bench players. It was a similar story early Sunday against the No. 20 Fighting Irish (7-7) as NU blasted out a 7-1 lead over the first 17 minutes. The quickness and agility of the likes of Fredericks and freshman midfielder Ally Palermo through the open field confounded Notre Dame’s defense and opened up lanes for the Cats’ forwards to cut uncovered in front of the goal. Unlike on Friday, Sunday’s visitors were able to adjust, rallying to get back into the game and cutting NU’s advantage to 9-6 in the opening minutes of the second half. Midfielder Maddie Howe carried Notre Dame on her shoulders, scoring 4 goals and making an impact in transition ball movement as well. But a goal credited to NU junior attacker Holly Korn that just trickled over the goal line with 27:37 to play seemed to turn the tide and ignite the hosts’ offense. Four minutes later, the advantage had been extended back to 6 goals and the Fighting Irish’s comeback hopes were effectively broken. Thanks largely to the efforts of Fredericks, the Cats dominated the faceoff circle on Sunday, winning a whopping 26 of 32 draw controls. While the team used superior talent and a shot-happy attitude to subdue Ohio State, outshooting them 34-12, that draw control dominance allowed them to rely more on possession and patience against Notre Dame. Redshirt freshman goaltender Julie Krupnick also made 12 saves over the two contests, including several point-blank stops Sunday, and junior midfielder Olivia Harpel capped off the weekend with her first career goal in the closing minutes against the Fighting Irish. “We have a lot of (offensive) weapons, the defense is playing really well together, and obviously … anytime you can win that many draw controls, it makes a huge difference,” Amonte Hiller said.